Bo-kuh? or Bo-kay? 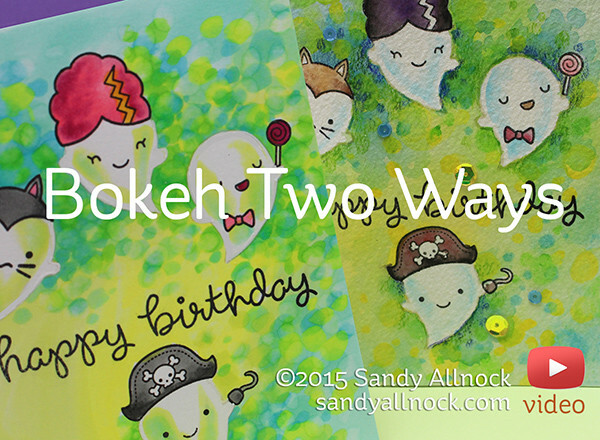 Either one works – and can be created in so many different mediums. 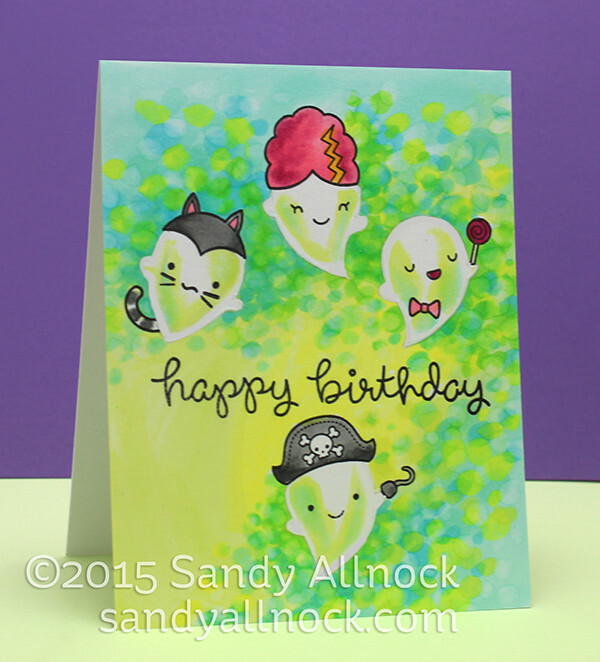 I’m showing you just two today, along with a stamp set that’s for Halloween, but can be also used anytime of year for the right audience – kids! I’ve wanted to create another bokeh video again, because whenever I do so on Instagram or Periscope, folks act like they haven’t seen it before…LOL! So here’s another to add to the queue (eventually maybe I should just make a playlist with them all!) I’m showing it in two mediums: my usual Copic technique, and then I played with some new markers I bought recently. Watch the video below, or click HERE to see it in HD on YouTube. To create a bokeh effect in Copics, first lay down a coat of basic colors. Then add dots — bigger ones are “cuter,” but you can do any size. Carry the dots of one color over into the color next to it, and vice versa, til they start to visually blend. In this particular image I also added an excess right around the ghosts, to be sure they popped out well from their background. In watercolor it can be a little more challenging, but is possible! You can try it in different types of watercolor too. Paints tend to layer naturally, but you may need to “dab off” some color with a paper towel or rag if you want some light colorations like I was going for. 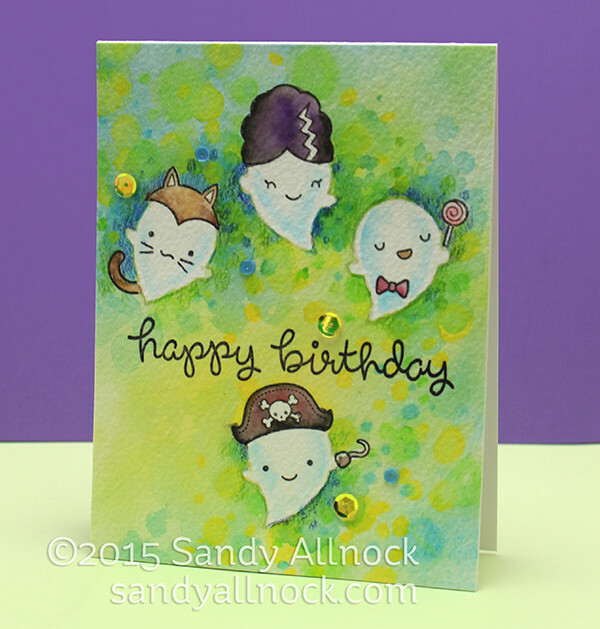 I mixed in some colored pencil too, to create some darker areas to pop the ghosts out of their background. Great comparison between the two techniques, Sandy! You are so creative, thank you!!! Super fun, effective and just wonderful! Thanks, Sandy! oh WOW! awesome technique. Love both cards. Love the way these turned out! My personal favorite is the watercolored one. I like the dreamier quality of the bokeh, and also the pencil shading. Great work on both! omg!!!!!! I LOVE THIS!!!!!!!!!! I would be HAPPY to give one of these master pieces a GREAT and LOVING home!!!!!!!! wink wink!!!!! What fun! Thanks Sandy. I managed to catch most of the all-day scope yesterday on my computer. Had to mute the sound for part of it so my co-workers wouldn’t hear it in the background (I work at home). Great job on the painting. I appreciate your energy and talent.